Come join us! Sunday mornings @ 10:30 am. We invite you to bring your children to our friendly and inclusive learning time; where they will learn about God’s love for us in Jesus! People of all ages gather together for worship. 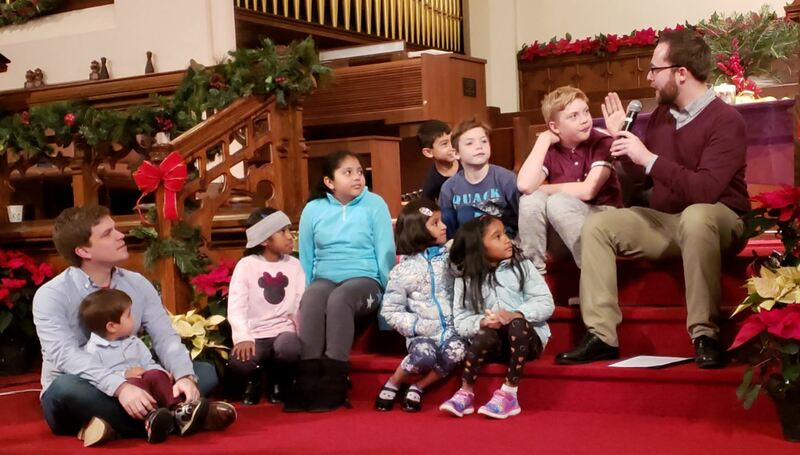 During the Sunday Morning Worship service, there is a pastoral message especially geared to children who are elementary and middle school ages. Following this message, the children meet in classrooms for Church School. All Youth & Children in Sunday School learn how to practice biblical teachings of love and caring by participating in community service projects. For infants, toddlers, and preschool-aged children, we offer a Crib Room during morning worship. With consideration of the needs and interests of the children and their parents, children of all ages are welcome to remain in the Sanctuary for the entire worship service. If your child (4th grade and up) would like to sign up to be an Acolyte for the worship service, please email Andrew Laro at alaro@fccstamford.org for more details! First Congregation Church conducts background checks on all adults who work with children, and we employ trained and certified childcare workers to work with our youngest children. Additionally, we maintain adequate staffing in classrooms on Sunday mornings to ensure the safety and comfort of both our children and teachers. Read about our Safe Church Policy here.